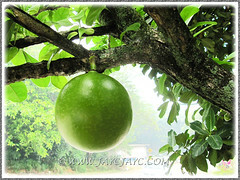 The Common Calabash Tree will look impressive in any landscape. Typically, a cultivated tree will soar to between 3-4.5 m (10-15 ft) tall and spread as wide as its height in measurement, providing much shade with its dense canopy. 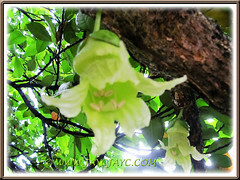 Nevertheless, it is the uniquely beautiful flowers and showy fruits that steal the show! We chanced upon the attractive Crescentia cujete about 2 years ago at Restaurant Siu Siu Sungai Besi in Kuala Lumpur and were captivated by the large fruits that hung on its multiple trunks and branches. That sighting convinced us that our neighbour had a similar tree planted at the sidewalk outside his home, yet we were oblivious of its existence until then. Hehee… unbelievably absurd, walking around like blind bats, have eyes but don’t see! Our friendly neighbour gave us a young fruit for the first time about two months ago when I showed interest and asked him about the colour of the fruit pulp, whether it’s white or black. Indeed, the fruit that we received had whitish pulp. It will turn black when heated or boiled with water and preserved/honey dates to produce a refreshing drink… wonderful when chilled. Out of curiosity, I made the drink and we drank 3 glasses each over the course of a day… and were none the worse after it, though there are conflicting articles online that stated that the fruit is toxic and inedible. Anyway, I did find it strange that the first green-coloured fruit given by my sister during my illness last year contained black pulp instead. I trashed that straightaway as I thought it was rotten. Contemplating about the colour difference now made me deduced that probably the pulp will darken as the fruit matures and ripens during a prolonged period of growth. Crescentia cujete has been widely naturalized and cultivated throughout the tropics of both the Old World and New World. Many gardeners, landscapers and even commercially interested parties worldwide, grow or cultivate the Calabash Tree for its multiple uses. Do scroll towards the end of this article under the sub-heading ‘Usage’ to know more. 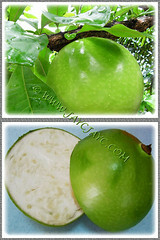 Common Name: Calabash Tree, Common Calabash Tree, Gourd Tree, ‘Mo Fa Kor’ in Chinese. Etymology: The genus name, Crescentia was named for Pietro Crescenzi (latininized to Petrus de Crescentiis). He was the 14th century Italian author of Opus Ruralium Commodorum, a book on agricultural science (reference: Dave’s Garden Botanary). Origin: Native to Mexico, Caribbean, Central and South America. It is the national tree of St. Lucia. Plant type: A tropical ornamental perennial tree. Features: Crescentia cujete is a popular species of the genus, Crescentia that consists of six species of flowering plants. An evergreen tree of medium growth rate, reaching between 6.1-9.1 m (20-30 ft) tall in the wild. It is multi-trunked with a rough bark and long spreading branches, forming a broad, roundish to irregular, open crown measuring 7.6-9.1 m (25-30 ft) wide. 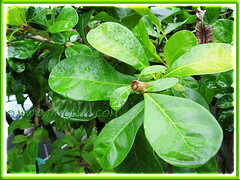 Foliage is bright green with simple leaves arranged along the arching branches with close-set clusters of leaves at the nodes. Leaves are entire, spoon-shaped or obovate, 5.1-15.2 cm (2-6 inches) long. Throughout most of the year, it will produce dark green buds that emerge directly from the tree trunks and along the lower thick branches. These will eventually burst into bell-shaped flowers that are 5 cm wide, greenish-yellow, and sometimes marked with red or purple veins. These gorgeous flowers will bloom in the evening and emit a musty smell to attract the Fruit Bat. When pollinated, the corolla together with the stamens will eventually fall off during the night, leaving only the two-parted calyx with the long stigma-bearing style still attached to the ovary. Interesting and fascinating to see the cauliflorus flowers and fruits scattered along the trunks and older branches of the Calabash Tree, emerging directly from the nodes. If you’re new to this tree, you’d think it peculiar when buds/flowers are seen at these unusual spots. Periodically, these flowers when pollinated by bats will then develop into green fruits that are large (up to 15-20 cm in diameter), round or oval. Wild trees produce smaller fruits, about half the size of those from cultivated trees. 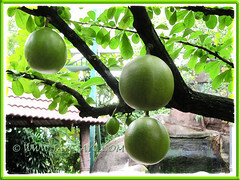 The fruit is short-stemmed, like a large melon with a smooth, thin shell yet hard and durable. An interesting read here on its flower pollination by other nectar-seeking insects besides bats. 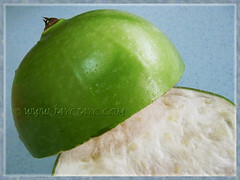 The fruit is filled with a solid mass of spongy, white pulp and embedded with light brown seeds that are small and flat. 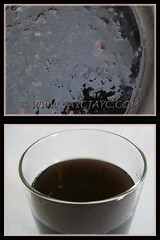 The pulp can turn black with age, so also the shell of fruits to dark brown. It takes about six months for the fruit to ripen. The fruit pulp from ripen fruits are sweeter than the bitterish young fruits. 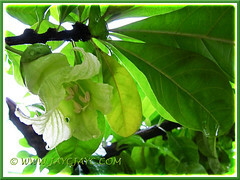 Culture (Care): Crescentia cujete or the Common Calabash Tree grows easily with minimum care. Light: Full sun to light shade for best growth and flowering. Moisture: Medium water requirements. It enjoys high humidity. Soil: Prefers moist, well drained and sandy loam soils though tolerant of any soil types. Others: Prune occasionally to maintain strong structure and encourage branching. Requires regular pruning for vehicular or pedestrian clearance beneath the canopy if grown in public places to avoid mishaps. Feed once monthly with a balanced fertilizer. Rather resistant to pest and diseases. For subtropical and temperate regions: Hardiness: USDA Zone 10b-11. Plant it in frost-free regions as it is most sensitive to frost and will be damaged by even a moderate frost. Flowers in summer. Propagation: Easily by seed germination or from stem cutting, the latter being the preferred choice as fruits are produced sooner. Usage: The attractive and interesting Crescentia cujete can be grown as a specimen tree in gardens with sufficient space. It’ll serve well too as a shade tree with its typical broad and open crown of spreading branches and dense foliage. 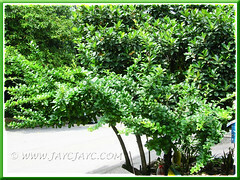 Also ideal as ornamental trees in residential areas, parking lots or median strip along highways. Besides, almost every part of the Calabash Tree, especially the fruits, bark and leaves, are being used for various purposes in many regions, worldwide. When hollowed out and dried, the hard shells of many sizes and shapes are carved to make utensils, containers, cups, scoops, ornaments and other artwork, as well as to create musical instruments known as maracas. Also used in folklore medicine, the pulp is used as a laxative, diuretic and anti-inflammatory agents, expectorant for relief of respiratory problems, cooling effect to reduce fever, etc. Its bark decoction is used for diarrhea and the wood for tool handles, saddles and ox-yokes. 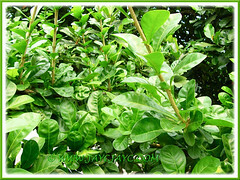 Pounded leaves are used as poultice for headaches and as topicals for wounds. Its sturdy trunks with rough bark and stout branches will be an excellent perch for growing epiphytes, orchids and bromeliads. 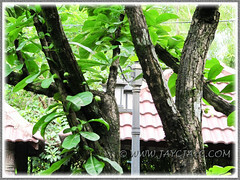 Check out some more uses of Crescentia cujete at Philippine Medicinal Plants. Crescentia cujete’s fruit is nutritive and beneficial, yet toxic! (Hence, for John and I, it’s hands off, now that we’re fully aware of its toxicity). That cute fruit, here in Venezuela we call “gourd”. No botanist knew his name until now. Thank you very much. Some people use the fruit pulp to condition and darken the hair. 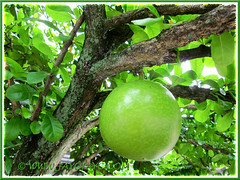 I had seen this tree and fruit and often thought that it was a Pomelo. And strange looking size that gets bigger like a bowling ball. Yara: You’re most welcome. Yes, they’re found worldwide and called many names. To condition and darken the hair… that’s news to me, thanks for sharing, my friend. You can still get it in a small pot with the flowerspike. The nursery sells them with Spanghum moss used as the medium. Remove them and plant it with soil. You can also get it in Giant and sometimes also sold in Tesco with reasonable price within RM10.00 also. A small clump in a pot but they tend to grow fast. They sell it with many flower spikes. Thank you for sharing this article on Mo Far Ko. 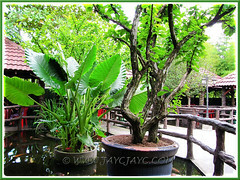 I wanted to plant this tree but I am not able to find it in the nursery. Would you know of any nurseries in KL / Selangor selling this plant? Sorry, I’ve no clue at all where this plant is sold. 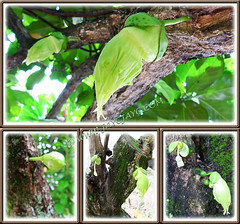 I am from Cebu, Philippines I am taking half glass every after meals of this fruit for about 1 month now, a lot of people are growing this fruit here for medicinal purposes. I put it the ref until supply last and its good when its cold. I am still observing if it cures my illness, hopefully it will not turn out of stock since some selling it now to grocery stores. Me I am getting it from my aunties garden after 5 years of waiting to bear fruit Nobody knew before how it looks like some called it lactobacelli fruit, when I brought it home to the city somebody told me its a miracle fruit and they too are taking it. When I happen to search it out here I could confirm this is what we are talking about here. Thank you for sharing this site. We really love sharing and you’re most welcome. I have planted one in Central Florida. Recently started to show flowers, but I’m curious when it going to show the fruits. Thank you for the information on this site. The flowers have to be pollinated before they can develop into fruits. Do follow the link I’ve provided at Features above that its flower pollination can be done by other nectar-seeking insects besides bats.